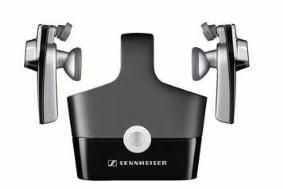 Sennheiser unhooks your ears with wireless headphones | What Hi-Fi? The system also uses diversity antenna technology to provide immunity to interference, and will give no lip-synch problems when used with portable digital video players. The maximum data-rate on the system is 2.37Mb/s, and it's said to be ten times more efficient than Bluetooth. With a day's use from a single charge, the heaphones come complete with a transmitter/carrying case with integrated charger, and can be used with any device having a 3.5mm output jack. The headphones themselves use a 14mm drive unit built specifically for this application and neodymium magnets, weigh just 10g apiece and have the company's 'Twist-to-fit' system to keep them in place.